Verna passed away peacefully at the Perth Hospital on Saturday, February 2nd, 2019 at the age of 94 years. She was predeceased by her loving husband Russel Ellis, sister Rose Jameson and brother Edward Greer. 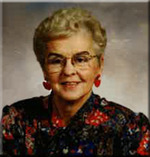 Verna was also predeceased by later life partners Lloyd Holloway and Leslie Merrifield. She is survived by her two sons David (Wendy) and Daniel (Mei) and nephews Grant and Evan Jameson. She will be sadly missed by her grandson Shane and great grandchildren Brody and Brianna. Verna's family wishes to extend a heartfelt thanks to Lorrie and all the Wellness Centre staff at Carolina Retirement Residence for their kindness, gentle support and professional guidance during the last few days. Our mother lived a long and happy life, always with a bright outlook and willingness to help others. Born in 1924, she is from a very different period, where family values were life's number one priority. Those old enough to remember, recall this time with fond memory. Family and friends are invited to a reception for the sharing of memories at Blair & Son Funeral Home, 15 Gore St. West, Perth on Friday February 15th, 2019 from 10:00 A.M. to 12:00 Noon. In remembrance of Verna, contributions to the Great War Memorial Hospital Foundation would be appreciated.